Each of our Chihuahua have such personalities. All are CKC Registered and Pedigreed. We have enjoyed these precocious little ones so much and love each as dear family members. 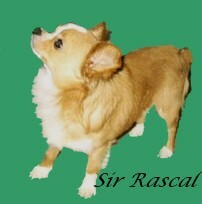 This is "Sir Rascal", the father to all our puppies. He is a Long Hair Chihuahua, Apple Head. He weighs in at 5 1/2 lbs. 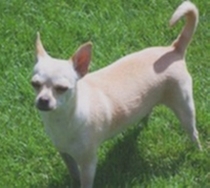 A very sweet and loving Chihuahua and very protective of his family. "Miss Belle" She is very intelligent and loving. She weighs approx 6 lbs. Although no longer part of our breeding stock she remains a loving and loved member of our family. A very quiet short hair deer Chihuahua. She weighs about 8 lbs perfect weight for breeding and whelping. She has short legs and at the end of her pregnancies her belly almost touches the ground. She has a loving personality. She has been an excellent mommy. She is shown here with a pup from a past litter. 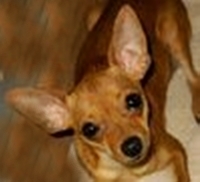 Very quiet, loving short hair Applehead Chihuahua. She weighs about 8 lbs as well. 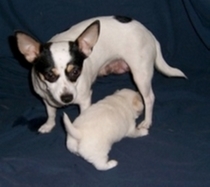 An excellent mommy, she generally has litters of 5 beautiful puppies. Tinkerbelle is very intellegent and the least demanding of our Chihuahua family members. 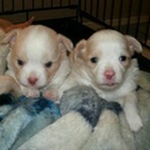 These last 2 are puppies we fell in love with and kept. They became awesome additions to our family. But never part of our breeding program. 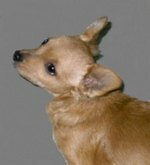 is a smooth coat Chihuahua and very spirited. She definitely keeps us entertained. As you can tell from her markings she is offspring of Miss Tipsy Two Spot. "Dandy Boy" is so special. 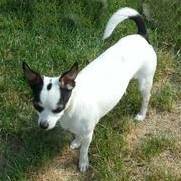 He is the largest of our Chi weighing above 12 lbs. He has a curly long hair coat and a very quiet loving personality. See whats happening in the nursery.